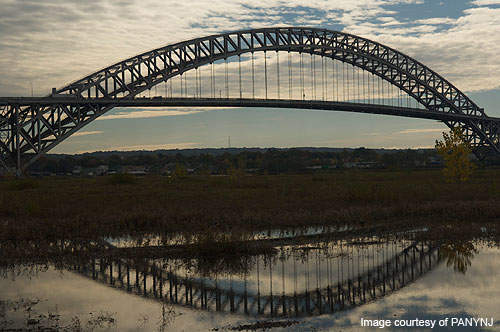 Bayonne Bridge is one of the longest steel arch bridges in the world. PANYNJ decided to invest $1bn on heightening of the bridge to 215ft above the Kill Van Kull strait from the existing 151ft by 2014. The bridge construction started in 1928 and was opened to traffic in November 1931. The bridge carries about 20,000 vehicles a day on its two lanes of traffic in each direction. The bridge was designed by Othmar Herrmann Ammann. Bayonne Bridge construction was undertaken by the American Bridge Company. Total length of the bridge is 8,640ft and the channel clearance of bridge at mid-span is 151ft. 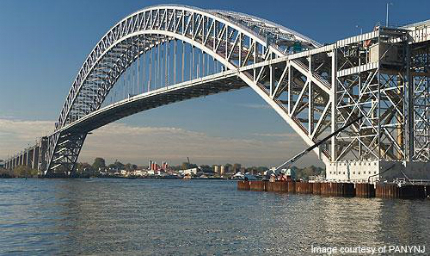 Bayonne Bridge is one of the longest steel arch bridges in the world. 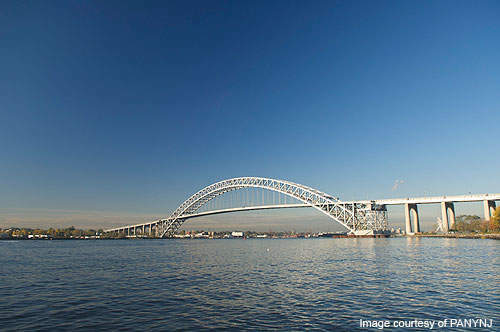 It connects the city of Bayonne, in New Jersey, with the Port Richmond area of Staten Island, New York, by providing a crossing over the Kill Van Kull strait. The main purpose of building the bridge was to allow easier passage of traffic from Staten Island to Manhattan through the Holland tunnel. The Port Authority of New York and New Jersey (PANYNJ) owns the bridge. With four toll lanes, the bridge carries 28 million commuter and commercial vehicles a year. The total eastbound traffic on the bridge was about 3.5 million vehicles in 2009. PANYNJ has decided to invest $1bn to increase the height of the bridge to 215ft above the Kill Van Kull strait, from the existing 151ft. "PANYNJ has decided to invest $1bn to increase the height of the bridge to 215ft above the Kill Van Kull strait, from the existing 151ft." The construction of the bridge started in 1928 and was opened to traffic in November 1931. The project required an investment of $13m. 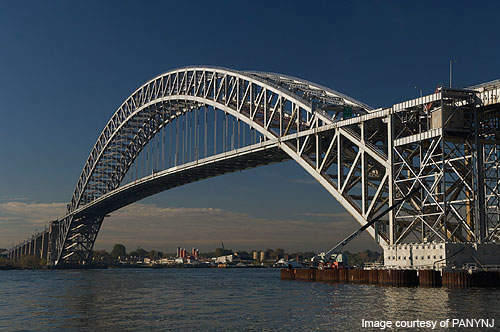 It is the first bridge to employ manganese steel for main arch rivets and ribs. Construction was undertaken by American Bridge Company. The steel arch bridge was designed by Othmar Herrmann Ammann. Cass Gilbert provided the architectural support. 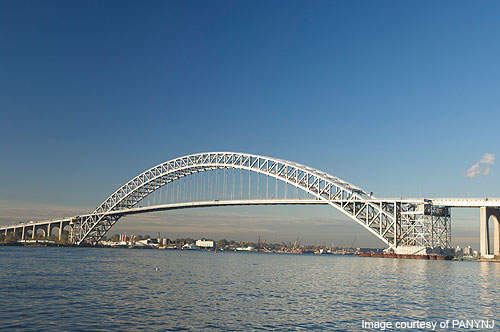 The arch shape of the bridge resembles a parabola, which is made of 40 linear segments. Total length of the bridge is 8,640ft and the channel clearance at mid-span is currently 151ft. It has two viaducts, one on the New Jersey side and the other on the Staten Island side, which span 3,010ft and 2,010ft respectively. The bridge structure raises 266ft above the Kill Van Kull and props up a roadbed for 1,675ft without any intermediary piers. It was designed to carry about 20,000 vehicles a day in each direction of its two lanes of traffic. The channel span of the bridge is too low and difficult for large container ships to pass under. The problem could increase once the Panama Canal is completed in 2016 and the colossal container ships from Asia start coming through 151ft navigational clearance. In October 2010, the Port Authority Board of Commissioners decided to expand the height of the roadbed and agreed to offer up to $1bn to help finance the project. The height of the bridge will be increased at mid-span from 151ft to 215ft. The project includes widening each of the four toll lanes from 10ft to 12ft. It also involves uplifting the existing approaches, ramps and main span roadway. Construction work is scheduled to start in mid-2013. An elevated roadway 19.5m over the current deck will be built,with the lower deck of the bridge being removed by mid-2015. The project is scheduled for completion in 2016. It is expected to provide employment opportunities for around 6,300 people. PANYNJ plans to undertake some of the expansion work, while the remaining work will be awarded to outside contractors. PANYNJ imposed traffic restrictions on the bridge, including limiting the height of vehicles to 14ft, width to 8ft and 6in, and prohibiting the transportation of hazardous materials. In addition, bicycle riders need to walk their bicycles across the bridge for safety. In the 1970s repairs to the north abutment of the bridge on the New Jersey side were made. "The main purpose of building the bridge was to allow easier passage of traffic from Staten Island to Manhattan through the Holland tunnel." The contract was awarded to VSL. The project included the installation of a cofferdam and removal of existing 3.5t granite blocks, concrete, multiple stages of concrete encasement and pressure grouting within the abutment. 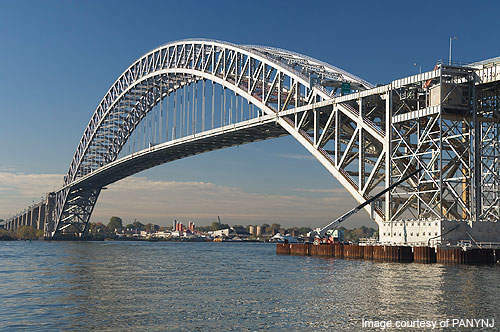 In 1970s, Spearin, Preston & Burrows was awarded a $29m contract to perform a seismic retrofit on the Bayonne Bridge to make it earthquake-proof. The bridge was strengthened in 2003 with the addition of 60 new longitudinal girders spanning 40ft between the floor beams. The project was awarded to the American Bridge Company. The steel grade used for the construction was Grade 70. 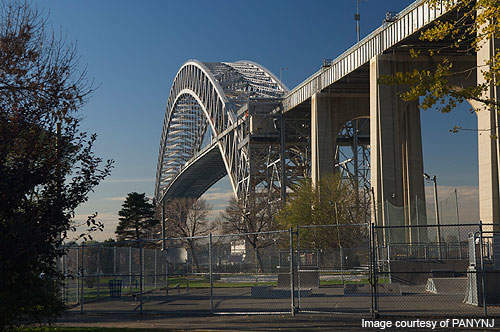 The fabrication work was completed by the American Bridge Company and Michelman Steel. In 2004, American Bridge Company was contracted to repair two secondary floor beams by adding reinforced structural members. 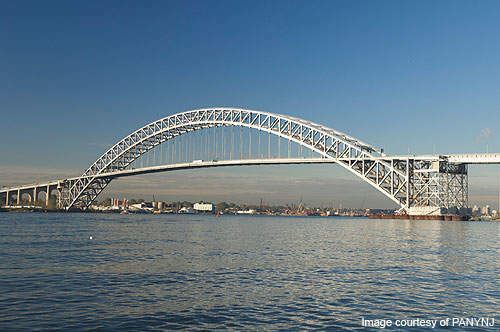 In July 2012, five companies were shortlisted for construction of the bridge. These were American Bridge (American Bridge, Tutor-Perini, Traylor Brothers); Bayonne Bridge Builders, Joint Venture (Schiavone Construction, Granite Construction Northeast, Yonkers Contracting Company, Defoe Corporation); CRJD Bayonne (Conti Enterprises., JH Reid General Contractor, Judlau Contracting, Dywidag-Systems International USA); Flatiron/EE Cruz/Tully, a Joint Venture (Flatiron Constructors, EE Cruz & Company, Tully Construction); and Skanska Koch – Kiewit JV Team (Skanska Koch, Kiewit Infrastructure).